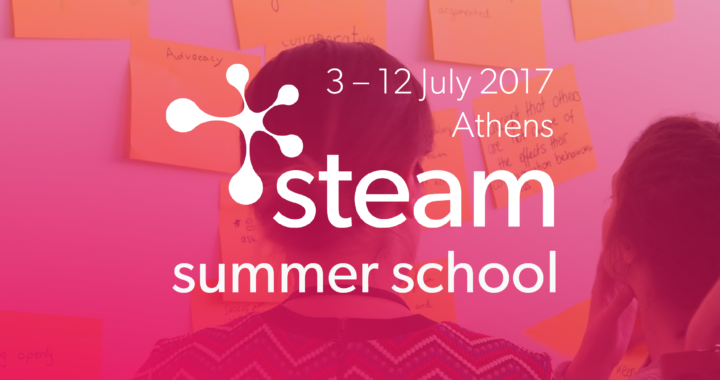 STEAM summer school is ready for its second round on 3–12 July 2017. Join us for a 10-days intensive training in science communication Marathon (just outside Athens), Greece. STEAM provides training in science communication for university students, researchers, and educators and innovatively marries science and art in science communication practice. The programme covers several aspects of science communication including journalism, arts, social media, management, policy, and theatre. It will be a fully immersive experience on science communication theory and practice but no previous communication experience is required. STEAM aims to train science communication ambassadors eager to engage with various sectors of the public back in their home countries. 1. Apply for Your Grant by asking your institute/school/research centre to apply for ERASMUS+, Key Action 1 (Mobility for Individuals) funds (for members of all European countries). Deadline 2 February 2016. 2. Apply for Our Grant to participate (for partner countries only). Applications open on 27 February 2017 and close on 7 April 2017. 3. Pay a Registration Fee. Registrations open on 27 February 2017. Early-bird reduced fee closes on 21 May 2017 at 23:59 (midnight) UTC/GMT. Full price registrations close on 4 June 2017 at 23:59 (midnight) UTC/GMT. For more information see www.steamsummerschool.eu or contact steam@um.edu.mt. Funded by the Erasmus+ programme, STEAM is led by the University of Malta, with the following partners: European Union of Science Journalists’ Associations (EUSJA, France), Haaga-Helia University (Finland), science communication company Science View (Greece), University of Edinburgh (United Kingdom) and Rhine-Waal University (Germany).